Sometimes I think that choosing a tripod and ballhead is more difficult and more confusing than choosing a camera. Tripods and ballheads can be as expensive as your camera and they come in all varieties, makes and price points. Until you get some experience using different ones it’s hard to decide what to buy. Let’s leave ballheads for another video and talk about tripods. A tripod is a tool. Like any tool, you need to use the right one for the job you are doing. If you choose a screwdriver that’s too small for the screw, you can still use it to remove the screw but it will be more difficult to do it. So start by asking yourself some questions: What type of shooting do you do—travel, night, portrait, landscape? Then think about your lenses. Depending on what you shoot and what lenses you own, you need to pick a tripod that will accommodate the weight load. The manufacturers listed weight load is just a guide and you are pushing it if your actual weight load comes close to the manufacturer’s listed load. Experienced photographers will generally tell you to double or triple the actual weight of the equipment you are using to match against the manufacturers listed weight load for a tripod. That being said, always remember that the best tripod is the one you will use. If you pick one that is too heavy or too big you are never going to want to carry it around and it is more likely to be left at home than packed for your trip. I own two tripods. I use each one for a different purpose. In this video I’m going to show you my Manfrotto 190 CXPRO4, 4 section carbon fiber pro tripod legs. The heaviest lens I own is the Nikon 70-200 f. /2.8 weighing in at 3 pounds, 6 ounces My Nikon D7000 weighs 1 pound, 8 ounces. So, without counting the weight of the ballhead, the heaviest load on top of my tripod will be 4 pounds, 14 ounces. If I’m using a teleconverter, a pocket wizard or the Nikon ME-1 microphone, I’m easily over 5 pounds. The Manfrotto 190 has an 11 pound weight load so I’m at about half of the recommended weight capacity when I’m using my heaviest lens. Even with this weight load, which is the heaviest gear I own, I have never had any problems with stability. There is no question that a good ballhead like my Really Right Stuff BH-40 has a lot to do with stability and I’ve never tested this tripod with a different ballhead. However, I don’t think I’d have a problem using the Manfrotto 190 with this gear even if I used a cheaper ballhead. It’s a very well built set of legs. I picked the Manfrotto 190 based upon a recommendation by Bryan Peterson, author of Understanding Exposure and other great books. It is strong and sturdy, weighing less than 3 pounds, it is light enough to carry around and put in the car to take on trips. The leg snaps feel secure and the tripod does not shake when extended even when there is a little wind when I’m shooting landscapes or doing long exposure night photography. I love the way the Q90 center column system allows me to move the center column to horizontal for macro work. It moves with a simple twist and nothing that needs to be screwed or unscrewed. In addition, the legs extend and bring the tripod about four inches from the ground. 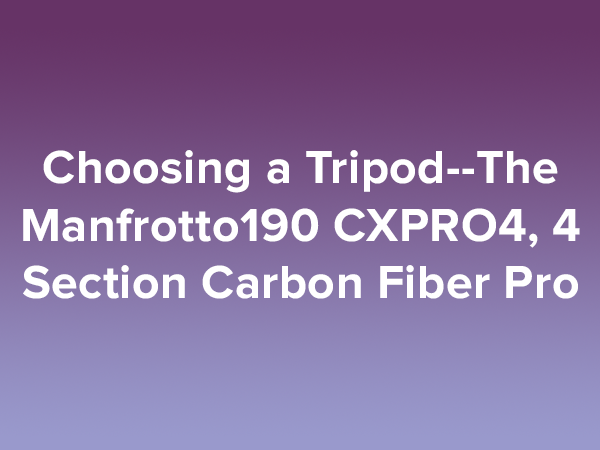 At a $300 price tag, the Manfrotto 190 CXPRO4, 4 section carbon fiber pro tripod legs make an excellent choice for a tripod that does not get left behind when I’m out shooting.